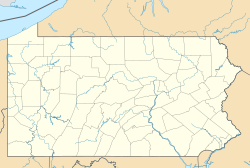 Egypt is an unincorporated community and a census-designated place in Whitehall Township, Lehigh County, Pennsylvania, United States, about 7 miles (11 km) north of Allentown and 1 mile (1.6 km) west of Cementon. Egypt is located on Pennsylvania Route 329, just west of its intersection with Pennsylvania Route 145 at Eagle Point. Early Pennsylvania German settlers of nearby present-day Lynn and Albany townships had named the area where they settled Alle mängel ("all deficiencies") due to the poor quality of the soil on which they were trying to farm and raise crops. By contrast, the soil here was found to be quite fertile, and early settlers named this region "Egypta," since ancient Egypt, with its fertile Nile delta, was the "granary of the world." In 1755, Jacob Kohler established a gristmill, located along the Coplay Creek just south of the church. The Troxell-Steckel House, which was built in Egypt in 1756, is one of the oldest buildings in Lehigh County and is today operated as a museum and historic site by the Lehigh County Historical Society. The Egypt area was also the location of Fort Deshler, a French and Indian War era frontier fort established in 1760 to protect settlers from Indian attacks. The fort, which was near the present intersection of PA Route 145 and Chestnut Street, stood until about 1940. The site is commemorated by a Pennsylvania Historical and Museum Commission marker. A granite marker, located just outside Egypt at Scheidy's Road and Spring Street, commemorates the last Indian attack in Lehigh County, which occurred on October 8, 1763, when nine settlers were murdered. The earliest hotel in the area was the Werley House, which operated from 1796 to 1815. The first "English school" (as opposed to one that taught students in the Pennsylvania German dialect) was organized in 1808. Other early industries in the immediate area included a carriage works, coal yard, bakery, tannery and silk works. Alfred Rushatz, born in a farmhouse in Egypt in 1940, graduated from the United States Military Academy in 1962, All-American football player and All-American collegiate wrestler, inducted into the USMA Hall of Fame, retired Colonel, US Army, 1990. [File, United States Military Academy]. Wikimedia Commons has media related to Egypt, Pennsylvania. ^ Roberts, Charles Rhoads (1908). "History of Reformed Congregation of Egypt Church" (PDF). Proceedings of the Lehigh County Historical Society. Allentown, Pennsylvania: Lehigh County Historical Society. 1: 71–101. Archived from the original (pdf) on 2008-06-26. Retrieved 2008-07-09. Gensey, Karen L. (2004). Whitehall, Pennsylvania: The Golden Strip of the Lehigh Valley. Kutztown Publishing Company. OCLC 262464697. Henry, Michael S. (1860). History of the Lehigh Valley. Easton, Pennsylvania: Bixler & Company. Roberts, Charles R. (1936). "Place Names of Lehigh County and Their Origin". Proceedings: Lehigh County Historical Society. Allentown, Pennsylvania: Lehigh County Historical Society. This page was last edited on 15 November 2018, at 02:50 (UTC).